For Monday morning, Feb. 8, commuters should expect limited underground Metrorail service to start at 7 a.m., and very limited Metrobus service from 9 a.m. to 7 p.m., as icy conditions on roadways and Metrorail tracks continue to be a barrier to providing safe service. MetroAccess service for Monday will be suspended for the entire day. Fewer than two dozen Metrobus lines will be in service on Monday, Feb. 8, from 9 a.m. to 7 p.m. due to snowy and icy conditions that persist on the region’s roadways. Metrobuses will stick to snow emergency routes to start the day. Customers may want to take advantage of the next bus prediction technology to get an idea when the next bus will be arriving by logging onto Metro’s web site or calling 202-637-7000 and saying, “Next Bus.” Buses are expected to be moving slowly on the roads, which remain slippery. This is a particularly rough showing for Metro in a time of dire need for the DC Metro area, and it’s not clear when things are going to get better with 4-8″ of additional precip expected this Tuesday night. 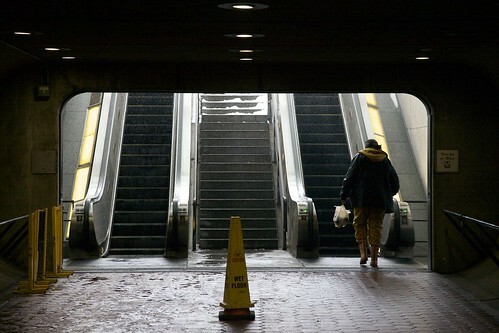 This entry was posted in: The District, WMATA, WTF? !